Trump Says 'I Think It Was Russia' And 'Others Also' In Election Meddling : The Two-Way President Trump declined to single out Russia when asked about U.S. election meddling. He instead criticized President Obama's reported response to learning about the election interference last year. President Trump speaks during a news conference with Poland's President Andrzej Duda on Thursday in Warsaw. President Trump reaffirmed America's commitment to a core NATO defense policy and discussed Russia's meddling in the U.S. election Thursday, in remarks to reporters and in an address delivered during a brief visit to Poland. Appearing next to Polish President Andrzej Duda, Trump accused Russia of "destabilizing behavior," delivering a rare criticism of the country. Trump has repeatedly said he wanted to improve relations between Russia and the U.S. The president is in Europe for the G-20 summit in Hamburg, Germany, on Friday. At Thursday's news conference, Trump focused largely on assailing both the U.S. media and his predecessor, along with criticizing Russia's actions abroad. When asked if he could definitively say Russia interfered in the U.S. election, Trump responded that "I think it was Russia and I think it could have been other people in other countries." He added, "I think it could very well have been Russia but I think it well could have been other countries and I won't be specific." He later said that "nobody really knows for sure," and separately, "it was Russia, and I think it was probably others also." He refrained from sharply criticizing Russia for any election interference and instead directed his ire toward former President Barack Obama. Trump said the CIA briefed Obama about election meddling in August of last year, but Obama "did nothing about it." "Why did he do nothing from August all the way to Nov. 8?" Trump said, saying the reason was because Obama expected Hillary Clinton to win the presidency. Earlier in the session, Trump spent time insulting the media, singling out CNN and saying "they have been fake news for a long time," and adding that "NBC is equally as bad." As NPR's Scott Horsley reports for Morning Edition, Trump also "questioned whether the findings of the U.S. intelligence community can be trusted." The president spoke one day before he's scheduled to meet with Russian President Vladimir Putin at the European summit in Germany. Responding to a question about the ongoing threat of North Korea and its missile and nuclear programs, Trump said they "are behaving in a very, very dangerous manner." "I have some pretty severe things that we're thinking about," he said, in response to the country's latest provocation, which this time was the launch of an intercontinental ballistic missile on Tuesday. Trump would not specify any U.S. action, stating, "I don't know, we'll see what happens" and "I don't draw red lines." 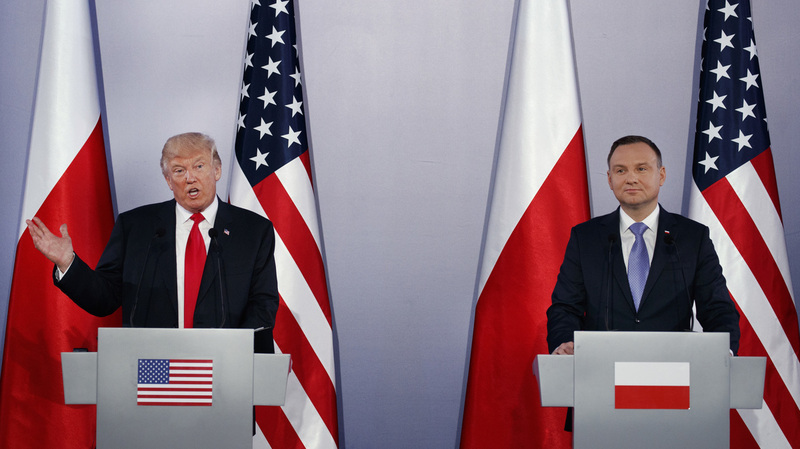 In a 35-minute speech delivered to a warmly receptive crowd in Warsaw that often chanted his name, the American leader reiterated the U.S. promise to fulfill its NATO obligation of defending allied countries — something he was criticized for not doing during a visit to NATO headquarters last month, when he accused other countries of not paying enough to fund the alliance. "To those who would criticize our tough stance," Trump said, "I would point out that the United States has demonstrated not merely with words but with its actions that we stand firmly behind Article 5, the mutual defense commitment." In his speech and at the news conference, Trump praised Poland for its military spending. Trump has criticized other European NATO members for not meeting the organization's goal of devoting 2 percent of their GDP to military spending. "As a result of this insistence, billions of dollars more have begun to pour into NATO," Trump said. "In fact, people are shocked. But billions and billions of dollars more are coming in from countries that, in my opinion, would not have been paying so quickly." Trump will meet other European leaders at Friday's G-20 summit, including his first personal meeting with Russian President Vladimir Putin since taking office in January.